Books about books and reading always fascinate me. It almost reminds me of the huge community we are – a community of readers. A community that can never go out of style (Hey! It is not a fad you know) and primarily a sense of togetherness that comes with it, knowingly or unknowingly. So I am always on the lookout for books about books. To read about someone else’s experience about reading and what books mean to them. It is a feeling I cannot describe. From reading Alberto Manguel’s thoughts on reading to discovering newer books and authors like this one. I must admit that I picked up, “Would You like Some Bread with That Book? And Other Instances of Literary Love” by Veena Venugopal, primarily for the title. I could not see how a reader could go wrong with such a book, or for that matter, how a writer could go wrong with writing a book on literary love. The book proved me right. Not at all times, but mostly, it did. From returning to rereading, “To Kill a Mocking Bird” in her childhood home (the only essay in the book which brought me to tears) to talking about books she read during her pregnancy and the impact they had on her, each essay is personal and unique, which lends the much required warm and funny tone to the book. While I rushed through the book (and read each and every word), there were times I felt that Veena also rushed with the writing. This thought came to me only with chapters seven and eight, which I did not like as much when compared to the others. The one titled, “Love in the Aisles” is my favourite, where she speaks of finding love in bookstores. It is funny and it is one essay, every book lover, bibliophile and reader will so relate to. The chapter on Saudi Arabia and the books on the country are fascinating, heart-breaking and ironical all at the same time. Veena sure has the eye for details and how to weave them into words. Books on books also serve a huge purpose – that of discovery. Every time I read a book about books, I end up knowing a whole lot of new authors and books which I would not have otherwise, or probably I would know of them but would not read them. A fresh perspective is always nice, and then it is the individual’s choice to accept or dismiss a read. I laughed out the loudest when I came across a part in the book, where Veena dismisses what everyone else is reading. The literary snob is truly a rare breed and should be respected, according to me. It is may be because I am one. I would never judge someone basis what they read, but I would never read that author. Different strokes for different folks, I guess. What Veena does in the book, is what every reader can relate to – she makes books her own. She possesses them and talks about them with most admiration and adoration. She makes you relate to everything written and that very few authors manage to do. All in all, “Would You Like Some Bread With That Book? And Other Instances of Literary Love” is a small gem, not to be missed, especially if you like reading and love books. 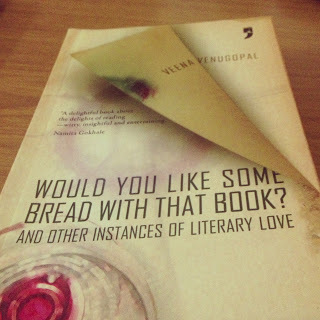 This entry was posted in Bibliophile, Books, Memories, Non Fiction, Review, Yoda Press and tagged Bibliophile, Books, reading, veena venugopal, would you like some bread with that book and other instances of literary love, yoda press on November 1, 2013 by thehungryreader. What is home? What is its meaning? Does it lose its value when disassociated from it? When torn away and not being able to look at it and then made to rely only on memory to experience what it feels like to be home. What is home then? What was home during the Partition of India? Two countries were formed no doubt. The herald of a new beginning some would say and yet it was disastrous for so many. Perhaps, it has reached a stage that while it exists in our subconscious, we yet are afraid to acknowledge its horrors. The fact that it happened – it took place and claimed lives is something too strong for us to give it its due and then when we fail to do that, we have art to remind us. All the time. Art makes us see what we do not want to. It makes us hear what we choose to become deaf to. It compels us to not turn our face to the other side. 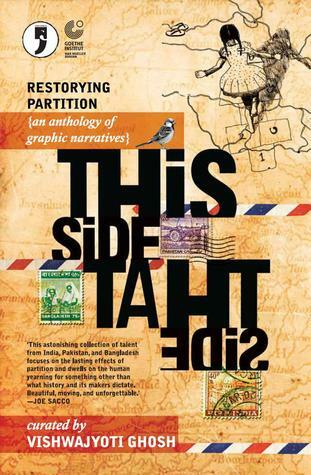 With this in mind and maybe more, Yoda Press in conjunction with Goethe Institut has published a brilliant graphic anthology on the partition of India and Pakistan, and also the creation of Bangladesh, called, “This Side, That Side: Restorying Partition”, which is curated by Vishwajyoti Ghosh. The collection is unique not in the sense that it is in the graphic format, but perhaps because it aims to store memories in the form of lines and drawings and black and white. The shades of grey have no need to be documented. They are there – all-pervasive and daunting. There are twenty eight pieces in this collection – written and illustrated by over forty people. A work of greatness, in the sense of the contribution and most empathic – sometimes bordering sentimental, however don’t those times deserve that? Memory doesn’t let go. I remember my grandmother telling me tales about partition, when she and her husband came to India. They had no choice, she would tell me and I didn’t understand then. I was but a child and now while reading this book, all I could think of was her. Displacement. It almost seems but a word till you face it. The stories in this collection look at every facet of Partition – whether it is in the most Bollywood of manner as portrayed in “An Afterlife” between two lovers who must part or in the way of the survivor as documented in “Know Directions Home?” depicting how a tribe moved from Pakistan to India and made a home for itself. It isn’t that because of the form of expression being different (graphic + words in this case), the impact is any lesser. You end up feeling the same. At some level, only a South Asian can understand this book and at another level it speaks universally to all those people who have left home or searching for home. Vishwajyoti Ghosh has done a commendable job of getting these people together and somehow while reading this book, you know that they share a common emotion – yearning and longing. It just doesn’t let go of you as a reader. “This Side, That Side” is not just another graphic novel. It has the effect of pulling you right in and making connections that you never otherwise would have. A read to be savoured. Page by page. Illustration by Illustration. Word by Word. This entry was posted in Books, indian fiction, Partition, Review, Yoda Press and tagged bangladesh, graphic novel, India, pakistan, partition, South Asia, This Side That Side, Vishwajyoti Ghosh on October 10, 2013 by thehungryreader.